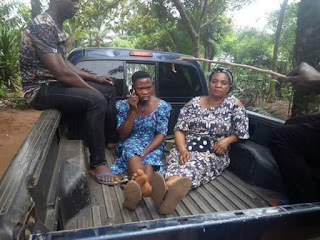 Home Latest news Igbo-eze south central neighborhood watch nabbed two women for selling a 2 days old baby(must read). This was posted by a Facebook User and tagged "What a wicked world".. This women where caught yesterday morning and arrested by the members of the igbo-eze south central neighborhood watch for selling a 2 days old baby. The fair woman Mrs Kate Ugwu who is from umugbabe village of ovoko in igbo-eze south LGA of Enugu state confessed that she was contacted by madam Ekwutosi Onodu to help her sale her sisters child as they do not need the baby in their family. Mr Kate says in a short video. Meanwhile the little mother of the child has been rushed to the hospital as she was found inside Ekwutosis room bleeding.